BlackBerry Messenger is one of the popular features of the BlackBerry device and is used by about 45 million users, and RIM seems to have started thinking about the opportunity to make money from Blacberry Messenger application. This Canadian smartphone companies are negotiating with four top recording firms such as Universal Music Group, Sony Music Entertainment, Warner Music Group and EMI Music.Music service become the theme this time and their services will be combined with the BlackBerry Messenger. 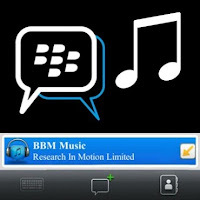 Blackberry Messenger Music is an application that allows you to download and share songs with friends through Blackberry Messenger applications and customers will be charged an additional fee of about $ 4.99 / month that allows subscribers to download unlimited songs directly from the original BlackBerry smartphone. This feature is expected to be very popular and useful consumer scooped young people.